Calf cramps can cause tremendous pain and force you to halt your swimming without warning. Because they are sudden and so debilitating, cramps can be dangerous, especially if you are swimming far from the shore or in deep water. They could even result in drowning for the unprepared swimmer. If you are experiencing calf cramping while swimming, your body is telling you that something is amiss and you need to meet your body's needs more effectively to reduce your calf cramping. Improper nutrition and hydration are the common culprits of calf cramping. While it may seem unnecessary to hydrate while in the water, the truth is that you are still perspiring while swimming and thus loosing fluids. 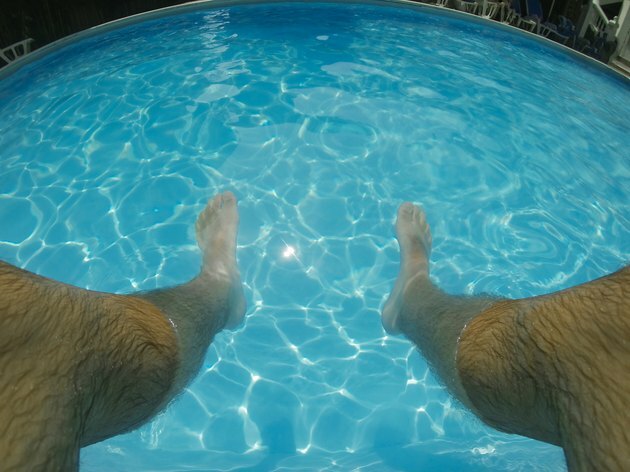 Make sure to hydrate before, during and after your swim routine to reduce your calf cramps. Additionally, calf cramps may be indicative of electrolyte imbalance from low levels of magnesium, potassium and calcium. You can use an electrolyte replacment drink during workout or add foods rich in these nutrients, such as a bananas for potassium, green leafy vegetables for magnesium and dairy products for calcium. Deconditioning, or becoming less fit, is a common cause of calf cramps, especially when swimming. Weak muscles with poor endurance are unable to adequately respond to a sudden increase in physical activity. This can result in microtears in the muscle and a lack of oxygen, which can lead to cramping. Because swimming is considered to be a reduced-joint-impact exercise, many people may start swimming when they have participated in little other prior physical activity and are out of shape. Take time to build up the length and intensity of your swimming sessions. Also, consider adding weight training and other aerobic activities to your routine to help improve your overall conditioning and physical fitness and reduce cramping. Add a few gentle stretches and a warm-up, such as a brisk walk or slow swim, before swimming and prolonged stretches after swimming as well to help protect your muscles. You may experience increased calf cramps when using fins and this is because you tense up your muscles more when using a fin to help control and coordinate the fin with your body. Work on swimming without the fins and make sure to relax your ankles and move naturally. When attempting to add fins, start with short fins first and swim on your back, taking care not to tense the muscles in your calf or shin. Graduate to larger fins after you are able to swim face-down with small fins without cramping. You may experience the most cramping with swimming at high speeds. This is because you plantar flex your ankles -- pointing your toes like a ballerina -- to get the most water resistance and power. However, this position is an unnatural position for your ankles and can cause tightness, tension and cramping in your calf. Slow down and pay attention to the movement of your ankles, allowing them to be relaxed and move normally rather than holding them in a tight position. Swim City: Cramping Your Style "Dealing With Cramps In The Pool"